In recent years there has been a greater push to get businesses to build online sales platforms, or E-commerce websites. While intuitively it seems that it would be a good idea to have your own E-commerce website, this is not necessarily true for all businesses, in a lot of cases it may even do more harm than good. Read on for help in determining E-Commerce or Brochure Website Which is Best Solution For My Business? 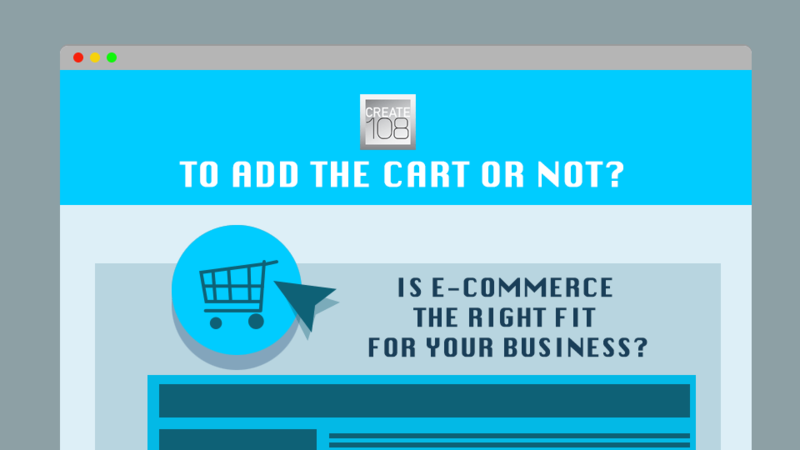 So just what are the differences between E-Commerce and Brochure websites, and which one is best for your business? Below are descriptions of what each option offers to help you make the decision that best suits your business. The primary purpose of an E-commerce website is to engage prospective customers to complete sales online through a website portal. This can be an invaluable way to cast your sales net further and capture more customers, who otherwise would not have access to your products/services. An Ecommerce website will have a Shop area, which primarily lists products/services, where necessary broken down into categories and sub categories. On clicking on a product/service you will be brought to that products details, including, price, dimensions, description etc. From there there is the option to Add to cart/Buy Now or possibly Add to Wishlist. Once the customer is finished shopping they proceed to the checkout where they complete their order and process the payment. On the retailers side they then receive the order and payment details and can then dispatch the product/service. A downside to E-commerce are the dangers posed by online theft and fraud, while people have become more comfortable with making online purchases, there will always be the justifiable fear of account hacking and the theft of credit card or banking details. While security measures are advancing all the time to combat online fraud and theft, so too do methods and techniques of the online fraudsters. In a future post I will cover what you should consider when building your E-commerce website and go into more details about payment gateways and how to keep your customers details secure. There are also greater costs involved in setting up an E-commerce website as opposed to a brochure website, so its best to do your homework on all the associated costs before hand. Costs to consider include, hosting, security, payment gateway charges, delivery costs as well as the higher build costs. To attract customers you will also have to budget for marketing and SEO costs. A brochure website has a much different function than an E-Commerce one, essentially being a tool to give customers an overview of a business as well as the sales and products it provides. In years gone by a lot of small businesses would look to larger corporate websites and feel that they needed to replicate the amount and scope of information that these bigger entitles had on their sites. Not only would was this a daunting task, it would often be counter productive, as according to Tony Haile the average website viewer spends only about 15 seconds on a website, which means that all those wonderful long pages of content never even get read. The amount of pages and content that gets published to a brochure website is individual to each business, however for SME’s my rule of thumb would be that less can often be more, with optimum content being about 300 words per page. In a previous post I have detailed the 5 basic pages that all SME Brochure websites should have. Outside of these it is good to add a few more pages which can help expand more on why prospective customers should make the choice to engage with your business over your competitors. When building your website enlist the assistance of a good web designer who has experience in a good User Interaction (UI) Design, they will be able to help you establish what these pages should be on your website. This entry was posted in Business and Brands, Business Tips, Online Presence, Social Media. Bookmark the permalink.